'The money bells go off': Is there a hidden wedding surcharge? A spot check by CBC’s Marketplace on wedding-related businesses in the Greater Toronto Area found some vendors will charge more for the same services when they know it’s for a wedding rather than a similar family event such as an anniversary party. It was the perfect start to 2017. 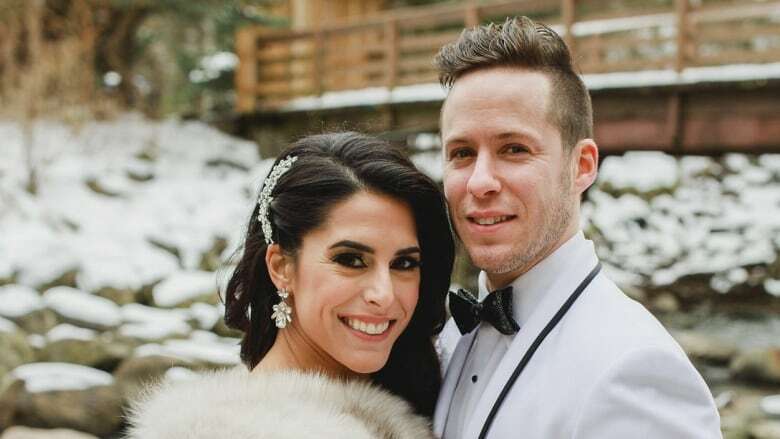 Lexi and Jason Kniznik professed their love in the ultimate way in front of family and friends on New Year's Eve, tying the knot in Toronto. But their wedding woes set in when they added up their bills.They went over budget by $7,000. The Knizniks believe there were a lot of hidden charges that weren't mentioned until one month before their wedding. "That's where all the extra expenses came in, near the wedding day. All these things were mentioned to me at the point of no return," says Jason. The "venue, the band, all the big ticket item things … we felt like we were charged extra." He breaks some of those additional charges down: The band cost an extra $1,000. 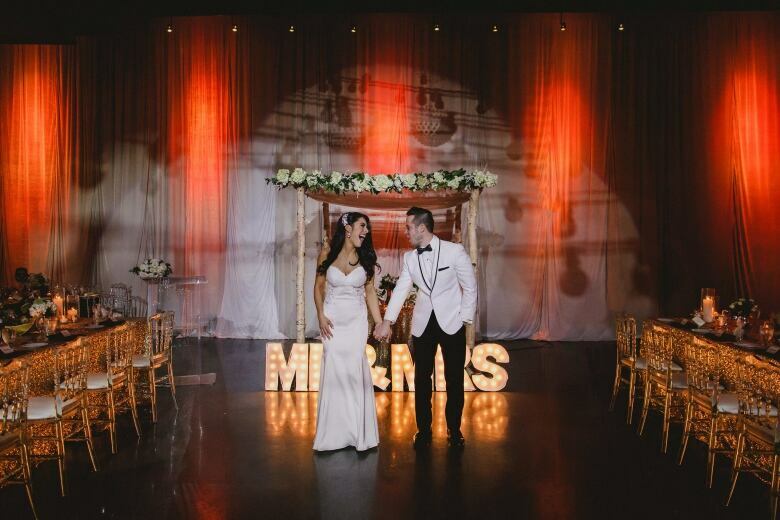 The venue cost about $2,000 more than what was stipulated in the contract and the lighting amounted to an additional $1,500 more than the Knizniks expected. In the end, they spent around $75,000 on their wedding. "It ended up costing more than we initially thought because there were things they should have told us in the beginning and we found out the hard way," Jason says. 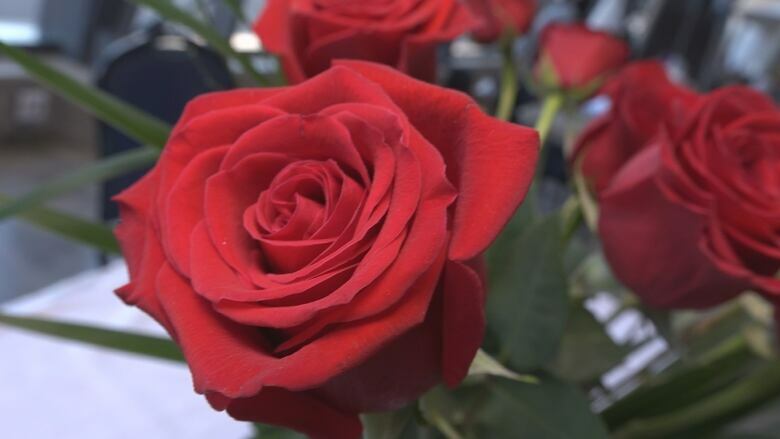 A spot check by CBC's Marketplace on businesses in the Greater Toronto Area found some vendors will charge more for the same services when they know it's for a wedding rather than a similar family event such as an anniversary party. To find out if there's an additional hidden charge, Marketplace sent secret shoppers to check out a dozen randomly chosen vendors in the GTA. One group inquired about a 25th wedding anniversary for their parents while the other group asked about a wedding. They investigated whether some venues, florists and limousine companies tacked on an additional charge for the wedding compared to the anniversary party. The request for each vendor was exactly the same. Both groups visited a mix of banquet halls and high-end venues, asked for the same date (a Saturday in September), the same guest count (200) and a three-course meal (salad, chicken entree and dessert) with a basic open bar package. Three out of the four venues charged more for the wedding. At one location, it added up to an extra $1,400 on a $15,400 bill. When each group visited florists, they asked for 20 centrepieces with a dozen red roses in a low glass vase. Two out of the four boutiques charged a higher price for the wedding. One location quoted the wedding $400 more, for a total of $2,000. Finally, each group called limousine companies and requested a one-way ride from the same downtown Toronto hotel to a banquet hall north of the city, a ride of approximately 42 kilometres. 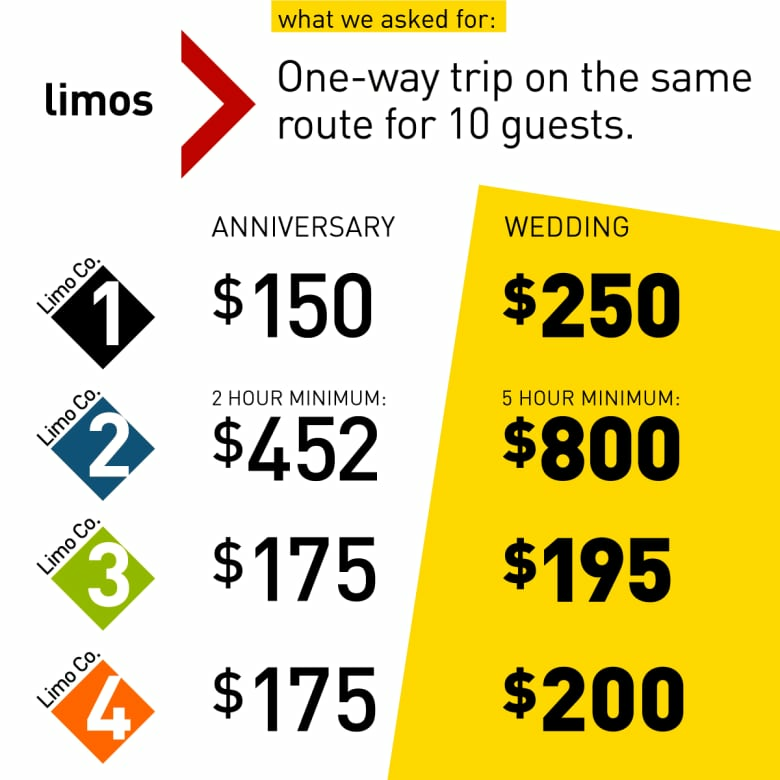 The wedding price tag was much higher than the anniversary for all four limo companies, ranging anywhere from an additional $25 on a $200 bill (not including tax and gratuities) to an additional $348 on an $800 bill for an identical trip in the same vehicle. One limo company would not book the wedding group for a one-way only ride because of its five-hour minimum policy for weddings. The anniversary group was offered a two-hour minimum. 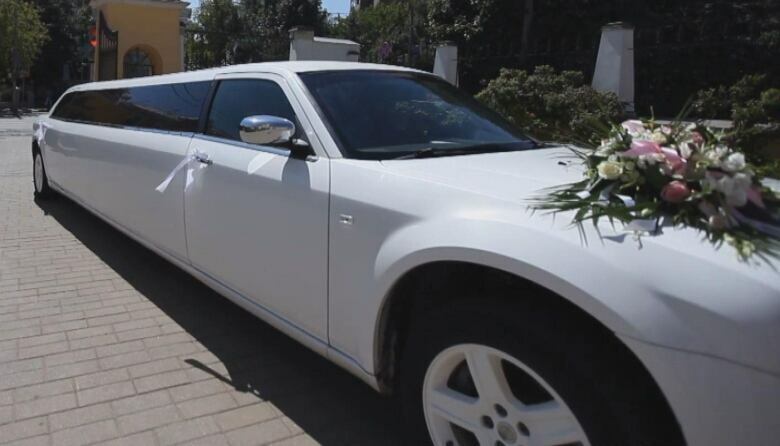 The owner of another limo company said weddings cost more because more attention is required. "Every bride wants everything to be perfect and there is no room for mistakes. That is a lot of pressure." Recent bride Jahmeelah Gamble, who got married in 2015 in Niagara-on-the-Lake, Ont., doesn't buy that explanation. She says transportation is a necessity, ensuring safety on the big day, and considers it unfair to attach additional costs to it. "Don't put this on the bride. That's really abusing a day that's supposed to be the most magical day for somebody. It's really disappointing to hear," she says. "The limo is more than a luxury and it's really sad that companies are putting an extra price tag on some of the necessities of a wedding." In the Marketplace test, the majority of the vendors (approximately 75 per cent) charged more for the wedding inquiry than the anniversary. In only one location did the anniversary group receive a higher quote. Marketplace contacted all the vendors in the test. 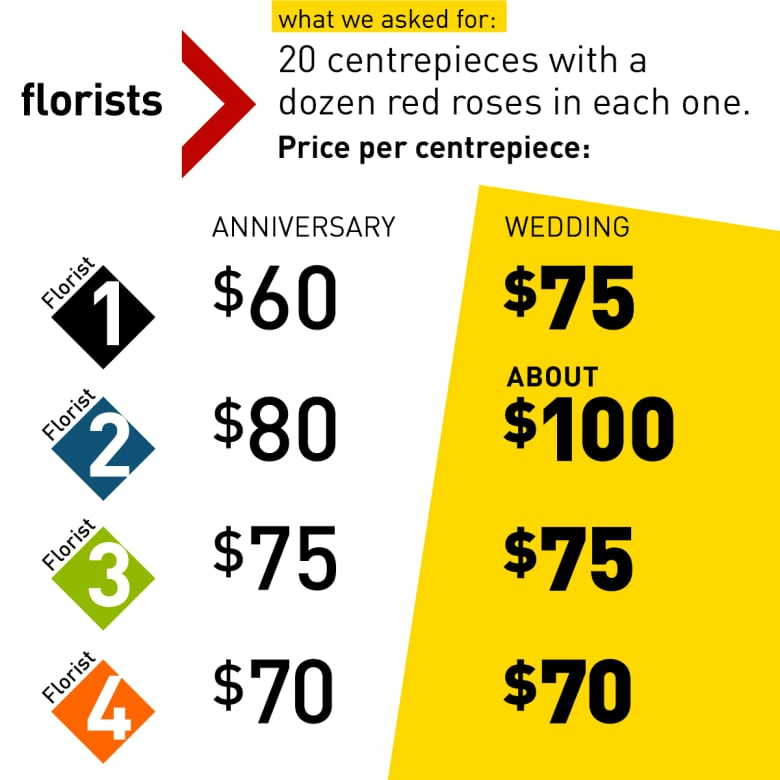 The two florists who charged both teams the same price say their pricing is transparent and they don't see a reason to charge more for weddings. The vendors that charged more for the wedding argue that weddings require more work. Angelique Sobschak, a former wedding planner who worked in the industry for more than 17 years, says upcharging and upselling are quite common. "The minute you say wedding, the money bells go off. Ding a ling a ling a ling." 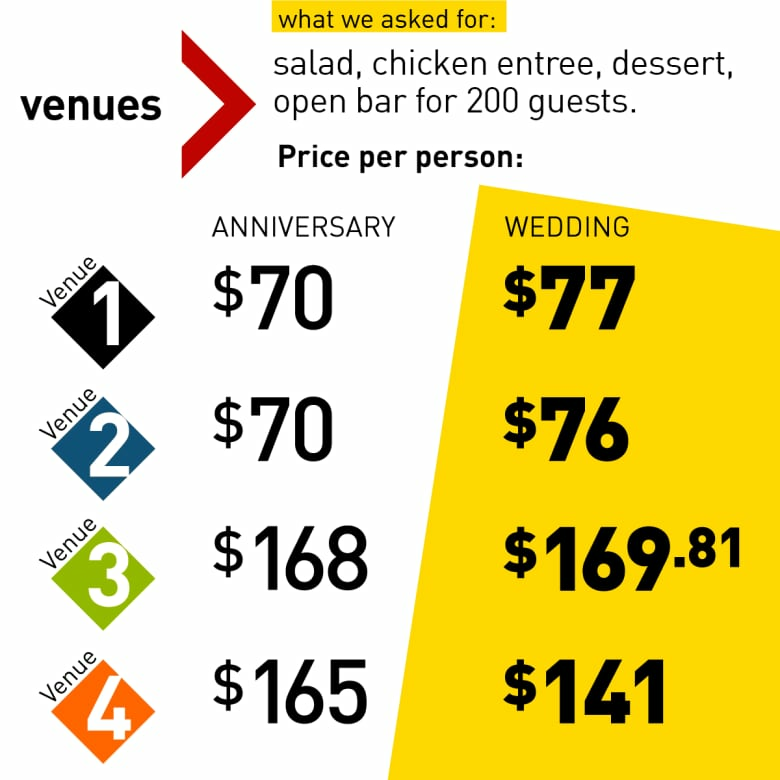 The Marketplace results are not surprising for Sobschak, who has noticed this kind of hidden surcharge when planning weddings compared to other big events. "I plan anniversaries, I plan birthday parties and I plan a lot of weddings and I see the exact same situation happening to me and my client," said Sobschak. "You can't get away from it, it's everywhere." 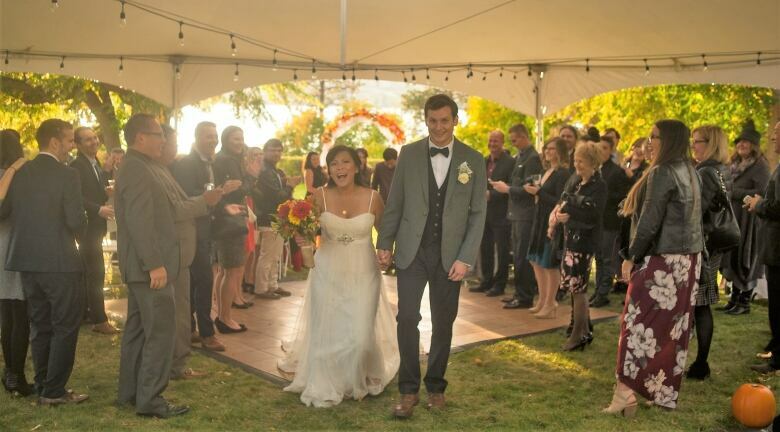 Chad and Janelle Rimell from Vernon, B.C., tried to keep their wedding costs down by having a small wedding last October with an expected budget of $8,000. They ended up spending $15,000, almost twice their budgeted amount. Janelle couldn't believe it. "It was a bit shocking when my husband told us how much we actually spent." Chad said they only discovered they went over budget a week or two after the wedding. "It would be difficult to have a fairly standard wedding ... for any cheaper than we did. We tried to cut costs where we could but even that didn't seem to make a huge dent in the final cost." The Rimells' final tally still came in lower than the estimated average cost of $32,500, according to WeddingBells Canada. Weddings are a $5-billion business in Canada, with more than 160,000 weddings taking place every year. Still, industry experts say there are ways to plan the perfect wedding while sticking to a reasonable budget, including having a flexible wedding date. Couples can take advantage of significant savings if they book a wedding on a Friday or Sunday or even host a winter wedding. Low-cost weddings draw out-of-town couples to Windsor, Ont. For the creative bride, do-it-yourself decor is always an effective way to cut costs. DIY stationery is also an option, with some websites offering free downloads of wedding signs, posters and invitations. Sobschak says couples need to shop around, tell vendors their budget upfront and don't be afraid to negotiate. "To really mitigate that problem where you get what we call sticker shock, you need to be clear. If your vendor cannot fit within your budget, then move on. Be educated. Know what they're charging you for … and go in knowing it's OK to say No." 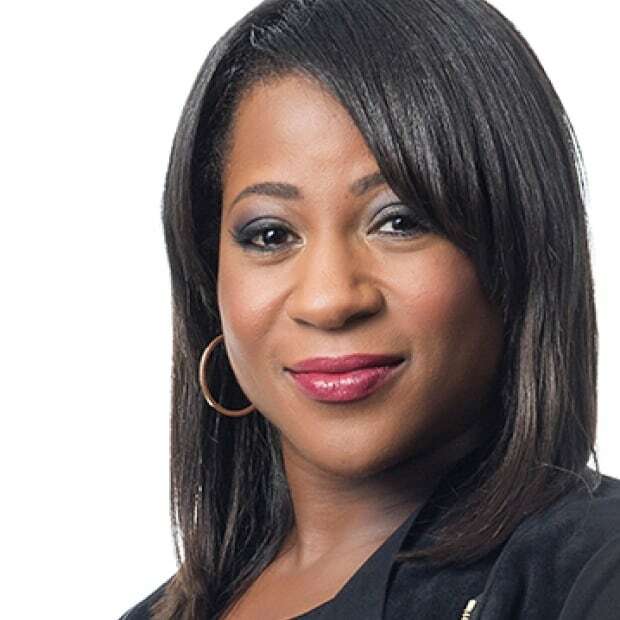 Asha Tomlinson is an investigative reporter with CBC Marketplace.